Sign your children up and they will receive a bag of Freshly Popped PTA Popcorn delivered to their classroom, once monthly on a designated Friday. Popcorn Days will start in September and run through May. If you have more than one child that you would like to sign up, please click "add one to my cart" for each child. This price is per child. If you have any questions, please email popcorn@ptamosspark.com. Your child will receive a free popcorn spirit stick for joining Popcorn Fridays! 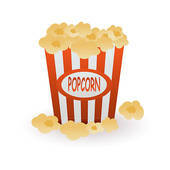 Click here to buy your popcorn! Click here if you would like to volunteer to help!